We are a network of 13 faith-based development agencies from across Europe whose purpose is to influence EU policy makers and decision-making processes in the pursuit of justice, peace and the eradication of global poverty. We bring many years of experience to the work. For 25 years we were known as APRODEV and since January 2015 as ACT Alliance EU. 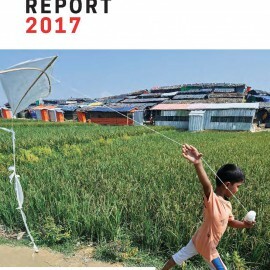 Our policy and advocacy is always rooted in the reality of our global partners and stakeholders, demonstrating the consequences of decisions made in Brussels on the lives of people in different contexts and in different parts of the world. We believe that Southern voices need to be heard and listened to in the European Union. Our three areas of focus are climate change, food security and the European Union’s development policy and practice. These are crucial and connected issues. We also engage in the relations between the EU and the Middle East, and the EU and Central America, and how they affect development and human rights. 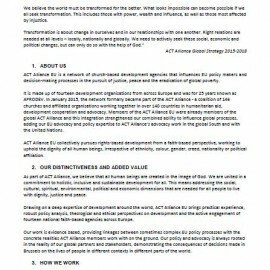 We are part of ACT Alliance, a global coalition of 140 relief and development agencies, joining our efforts to influence global policy making by combining our EU advocacy and policy expertise with ACT Alliance’s advocacy work in the global South and with the United Nations. We follow the overall guiding principles of ACT Alliance and adhere to the quality and accountability framework of the ACT Alliance, in particular the ACT Code of Conduct. We are a faith based network. As such we pursue rights-based development from a faith-based perspective, working to uphold the dignity of all human beings. We are united in a commitment to holistic, inclusive and sustainable development for all. This means addressing the social, cultural, spiritual, environmental, political and economic dimensions that are needed for all people to live with dignity, justice and peace.